For a couple of months now, leaders from the world of politics, business and entertainment have been lining up to make a declaration: poverty is sexist. Back in March, 86 leaders – from Sheryl Sandberg and Melinda Gates to Oprah and Bono – signed a public letter stating exactly that. The declarations are all part of a campaign from ONE, an organization that works to end extreme poverty. But what exactly do they mean when they say poverty is sexist? 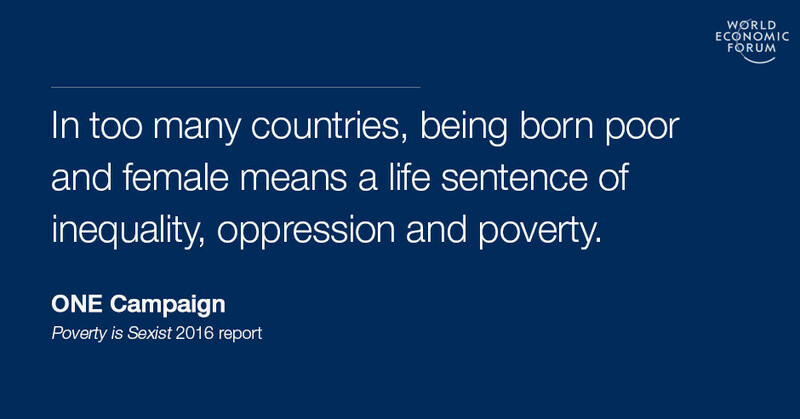 The argument boils down to this: in every sphere, women are disproportionately affected by poverty. So the measures we’re putting in place to end it must be specifically targeted at them (something development specialists refer to as gender mainstreaming). Of course, the root causes of poverty are complicated. But across a whole range of measures that we know play some role in determining an individual’s economic and social well-being, we see that women and girls consistently come off worse, as these charts show. “When people have access to the tools and knowledge of the internet, they have access to opportunities that make life better,” the Poverty is Sexist 2016 report notes. But as the International Telecommunications Union found in its latest analysis of internet penetration, women often struggle to access those tools. It’s been called the great equalizer, and few people would disagree that education is one of the best ways to help people escape the poverty trap. But while progress has been made in closing the primary education gender gap – more than two-thirds of countries around the world have managed to do so – the secondary education gender gap has proved more stubborn. 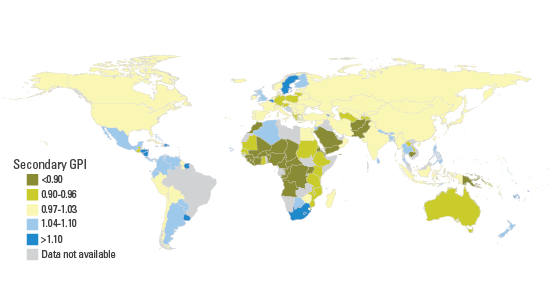 As this map from UNICEF shows, in many countries the gap is still large. It is at its largest in West and Central Africa, where only 79 girls receive a secondary education for every 100 boys. Around the world, women produce over half of food that is grown. In some regions – like sub-Saharan Africa and the Caribbean – that figure is even higher. And yet, although women work the land, it’s still mainly men who own it. While there’s no exact global number (the much-thrown-around 2% figure has been discredited) data on the country level for Africa shows how big the divide is. The World Bank has described access to finance – formal loans and bank accounts, for example – as vital to escaping poverty. And yet here too, we see a large and consistent gap between men and women in every region. As this chart shows, while over a quarter of men in low-income countries have an account at a financial institution – a figure that’s still too low – only 19% of women do. It’s hard to put an exact figure on the gender breakdown of poverty. Although people and organizations have tried, the fact is that most of the data doesn’t go into much detail. But even those who point this out – such as Duncan Green, Oxfam’s head of research – recognize that poverty has a gender bias. And that matters far beyond questions of fairness. For example, research suggests that women invest much more of the money they earn into their families than men do, meaning that female economic empowerment can have a positive ripple effect far beyond the individual. If we want to eradicate poverty in all its forms – as the world committed to in September 2015 – we need to recognize that often, poverty is sexist. And then we need to start doing something about it. Is this the generation that eradicates extreme poverty?